Traveling through ‘no-man’s land’ has been a physical and emotional challenge for Sally Becker. In 1993, the then 33 year-old started delivering medical aid and food to the small, besieged community in Mostar at the height of the Bosnian War. Having won their trust, the commanders of the Croatian army allowed her to evacuate wounded Bosnian children and their families. Following this evacuation she was dubbed ‘The Angel of Mostar. Here is the story of her work with Hadassah. When you enter Hadassah you enter a safe haven where it doesn’t matter who or what you are. Muslims Christians and Jews have worked alongside each other at the hospital for almost 100 years. The staff are there to help save lives and everyone is equal. Through an introduction from Ron Finkel President of Hadassah Australia, I met with Dr Osnat Levtzion-Korach, Director of the hospital. We were joined by Prof. Abu-Vasal Bassam, the Senior Surgeon, Prof. Shaya Wexler, Director of the Centre for Children with Chronic Diseases and Prof. Micky Weintraub, Chief of Hadassah’s Paediatric Department for Haematology and Oncology. I explained that I am hoping to establish a humanitarian corridor from Gaza to Jerusalem that would enable children to have access to medical treatment even during times of war. There are many children in the West Bank and Gaza who require regular and recurring treatment for chronic illnesses like Cystic Fibrosis, kidney disease and cancer. Hadassah have set up satellite clinics and outreach programmes in some of these areas but facilities and staff are limited. Professor Eitan Kerem, the head of Hadassah’s Cystic Fibrosis Centre recently established a satellite clinic in Gaza with the help of a dedicated Palestinian Health Care Team. The centre, which opens one day a week, is staffed by volunteers who have not specialized in CF care so Hadassah is now providing specialized training to a team of Palestinian health professionals—three physicians, a nurse, and a physiotherapist—so they can give optimal treatment to their patients. While CF is a very complicated, multisystem disease which has no cure, a specialized, multidisciplinary staff can ensure a better quality of life for its young victims. Children requiring more complex treatments like chemotherapy and kidney dialysis must travel to Israel for treatment. This involves numerous applications for permits and funding for transport and during war time it becomes more difficult. Dr Osnat assured me that if we can arrange for these patients to be brought to Hadassah, the hospital would be happy to help. Around the corner is the St John’s Eye Hospital, originally established in Jerusalem in 1882. With high rates of poverty in the region, the hospital makes their services available to all, treating patients regardless of their ethnicity, religion or ability to pay. They are often supported by Doctors from Hadassah who make no charge. 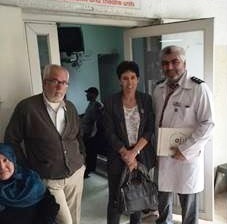 I was invited to visit their satellite clinic in Gaza City and armed with permission from the IDF and Hamas, I was taken through the Erez crossing. Accompanied by Paul Williams, Head of Administration at St John’s, I walked along a passage which runs for about 1 kilometre between Israel and Gaza. I had made similar journeys through no-mans land in Bosnia and Kosovo but although this time there were no snipers shooting at me, the silence was ominous. Gaza is one of the most densely populated regions in the world with over 1.8m residents. Donkeys pulling loaded carts weaved in and out of the traffic and clouds of dust and diesel filled the air. Each time we reached an intersection, our driver would dodge around the oncoming vehicles, beeping at pedestrians who seemed intent on throwing themselves in front of our car. We pulled up outside the clinic where hundreds of people were waiting to be seen. St John’s is the only charitable provider of expert eye care in Gaza and their work is incredibly important as rates of blindness are ten times higher in the Palestinian territories than in the West. 80% of blindness is preventable so their intervention is vital. Tens of thousands of Gazan patients rely on treatment at the clinic which works alongside the Jerusalem hospital. For those needing complex surgical intervention, they have an effective referral system which supports patients in negotiating the permit system to gain access to their hospital in Jerusalem for treatment. In spite of immense difficulties and the dangers faced by the staff, the clinic continues to operate in what is essentially still an emergency situation. I was introduced to Dr Majed Abu Ramadan, a Consultant Ophthalmic Surgeon who is also the Mayor. He drove us to the port and we ate in a restaurant that overlooks the colourful fishing boats bobbing out on the water. The restaurant could seat hundreds of people but apart from ourselves and the waiters, we were the only people there. Dr Majed explained that the incidence of diabetes related problems like Retinopathy and Glaucoma are very common amongst the Palestinian population and so screening is essential. People in outlying areas have no means of transport so the clinic is hoping to secure mobile equipment. On our way back to the border we passed through an area that sustained much of the damage during the conflict. In contrast to the smart apartment blocks that lead down to the port, the bleak landscape of burned out buildings bear testament to the war. Some families have returned to what is left of their apartments and live amongst the ruins of the place they still call home. There are no real signs of peace as yet and the deep-seated barriers of distrust that exist between Palestinian and Israeli societies only serve to perpetuate the conflict. But as long as there are people who are willing to put aside politics in order to help sick or wounded children, there is always hope.